The Atlantic Spanish Mackerel (Scomberomorus maculatus) is a shallow water migratory game fish offering great sport on light tackle. The schools will follow rising water temperatures along the east coast of the United Sates. Spanish Mackerel are most likely the brightest colored of the mackerel having a green back, shading to silver on sides, golden yellow or grayish irregular spots above and below lateral line. The front of dorsal fin is black and the lateral line curves gently to base of tail. 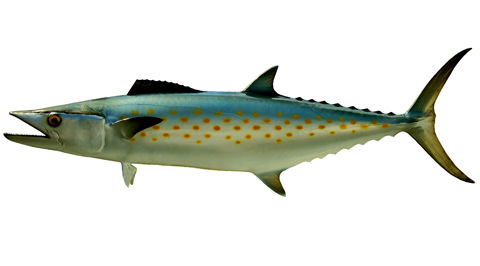 People often confuse Spanish Mackerel with juvenile kingfish. The certain way to identify a Spanish Mackerel is by their lateral line which does not dip strongly like its “cousin” king mackerel. Spanish Mackerel’s are found in, near-shore as well as off-shore, preferably over grass beds and reefs and are not present in north Florida waters during winter. You can catch Spanish mackerel off the beaches in the fall and early winter and once again in the spring. Spanish mackerel are schooling fish that migrates northward in spring and return to southerly waters when water temperature drops below 70 degrees F. Spanish mackerel spawn offshore, spring through summer and feed on small fish and squid. Diamond jigs and a thin wire leader work great for catching these game fish that have keen eyesight and loads of speed.